Here sales up to £1000 are in light blue; sales between £1000 and £5000 are in normal blue; and sales of more than £5000 are in dark blue. 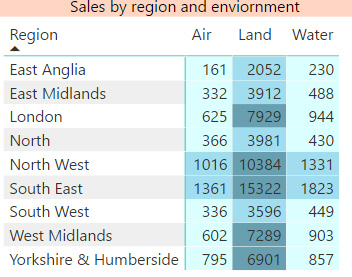 One way to start conditional formatting is through the field well (right-click on the field whose foreground or background colour you want to set). 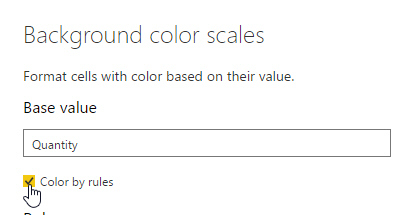 Tick this box to set formatting rules. Here we've set 3 rules. 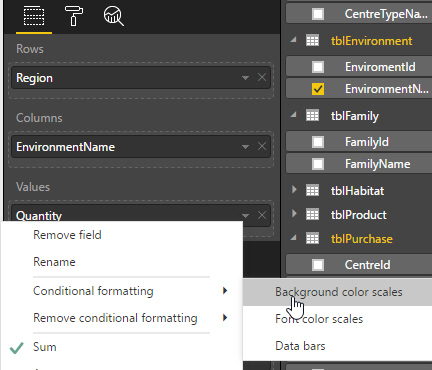 Power BI Desktop will apply rules in the order specified. For this example, this means that any number between 0 and 1000 will satisfy the first condition, meaning that the other two conditions will never be tested.